Where do I use my House of Holland voucher code? At House of Holland, you can discover all sorts of stylish fashion for both men and women. Shop by style to find women’s summer essentials, dresses, t-shirts, skirts, tops, trousers, sweatshirts, jackets, tights, socks, denim, eyewear and bags. You can also discover a sale section where there’s up to 50% off, a t-shirt shop and an SS18 section too. If you’re searching for menswear you can find t-shirts, jeans, trousers, outerwear, sweatshirts, special prices on a range of clothing, as well as a stylish t-shirt shop. If you’re looking for a particular item of clothing or a specific outfit or style then check out the ‘Shop the gram’ section. Here you’ll find tons of trendy pictures showcasing House of Holland’s clothing. You can meet the strong and ambitious females in the House of Holland community out there living their best with #HOHLife. In the #HOHLife section, you can find information and profiles on Aimee Phillips, Violetta Kassapi, Emma Breschi, Poppy Ajudha, Glowie, Anna Barnett, Fenn O’Meally and Elizabeth Ilsley, all of which are extraordinary and stylish females who love the House of Holland brand. If you’re shopping on a budget then check out the House of Holland sale section. Here you’ll find huge discounts of up to 50% off on selected women’s clothing. Find price reductions on bumbags, hoodies, dresses, skirts, trousers, jumpers, shirts and much, much more, all of which are extremely stylish and on trend. If you can’t find the item you’re looking for in the sale section then make sure you check back another time as the sale section’s updated regularly. Or, you can always use a discount code from us to save money on your order instead. Returns can be made within 28 days of receipt for a refund of an item. Exchanges can be made for different colours or sizes provided they are in stock. For returns outside the 28 days, period House of Holland will happily exchange the product to the value that it was purchased at. Please note that in the interest of hygiene, tights, underwear, swimwear or earrings cannot be returned. House of Holland is a British fashion brand that creates stylish men’s and women’s clothing and accessories. Founder of the brand, Henry Holland is held in high regard in the fashion world dressing all kinds of celebrities such as Rita Ora, Gwen Stefani, Lady Gaga, Kelly Osbourne, Alesha Dixon, plus many more famous names. Shop online with a House of Holland discount code from us and save money on your order. 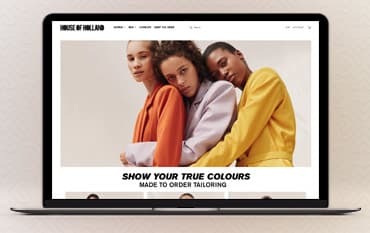 You can also check out tons of great deals and offers on our House of Holland retailer page too.